Although David Cameron stated this week that there is a “growing” parliamentary support for air strikes against ISIS in Syria, it seems there is a significant proportion of the British public who do not hold the same opinion. A full day’s debate is set to be held in the House of Commons tomorrow (Wednesday), followed by a vote on whether to authorise RAF planes to bomb Islamic State targets in the Middle East nation. 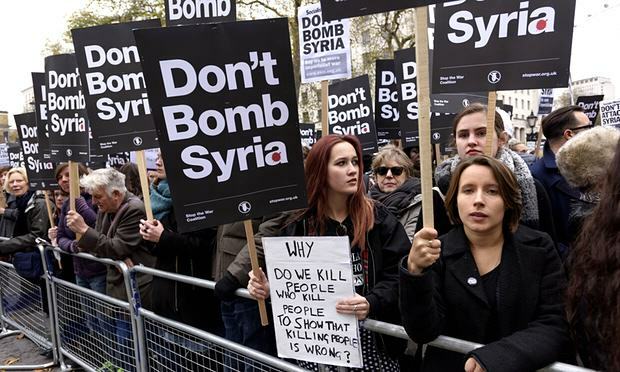 Thousands of anti-war protesters are expected to stage an emergency demonstration in Parliament Square outside Westminster this evening in a last minute bid to try and sway MPs on the eve of the vote. There were also protests across the country on Saturday. Cameron officially announced the debate today and, the fact he is bringing it before the House, indicates he is confident of winning. 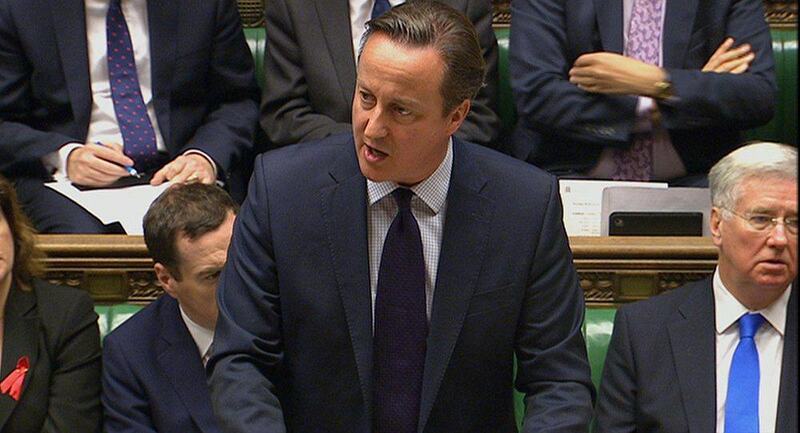 I can announce that I will be recommending to cabinet tomorrow that we hold a debate and a vote in the House of Commons to extend the air strikes that we have carried out against Isil in Iraq to Syria, that we answer the call from our allies and work with them because Isil is a threat to our country and this is the right thing to do. Labour leader Jeremy Corbyn has criticised the decision not to hold a two day debate on the issue, saying David Cameron should stop the “rush to war” and claiming the West won’t be able to “bomb our way to democracy”. However, Defence Secretary Michael Fallon has claimed Islamic State need to be stopped after a significant increase in terrorist attacks by the organisation over the last year, especially with the UK a prime ISIS target. Those against air strikes in Syria have stressed that no matter how accurate the missiles are, hundreds of Syrian civilians may lose their lives in the bombings, while many will question what the PM’s exit strategy is, especially after the issues surrounding British intervention in Iraq and Afghanistan. A useful graphic courtesy of ILM Feed, produced using statistics cited by Sky News, also shows what the cost of the strikes in Syria would be to Britain and the taxpayer, and the useful things that cash could potentially pay for instead. 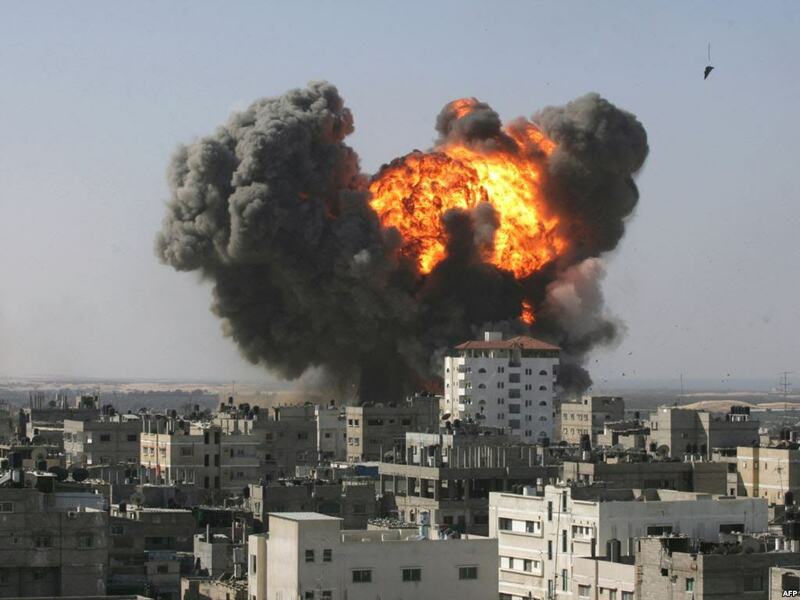 All in all, a six-hour bombing mission in Syria works out at a cost of £508,000. It’ll certainly be interesting to see if the cost of the strikes, as well as the humanitarian and diplomatic implications of such action, will be brought up in the House tomorrow. 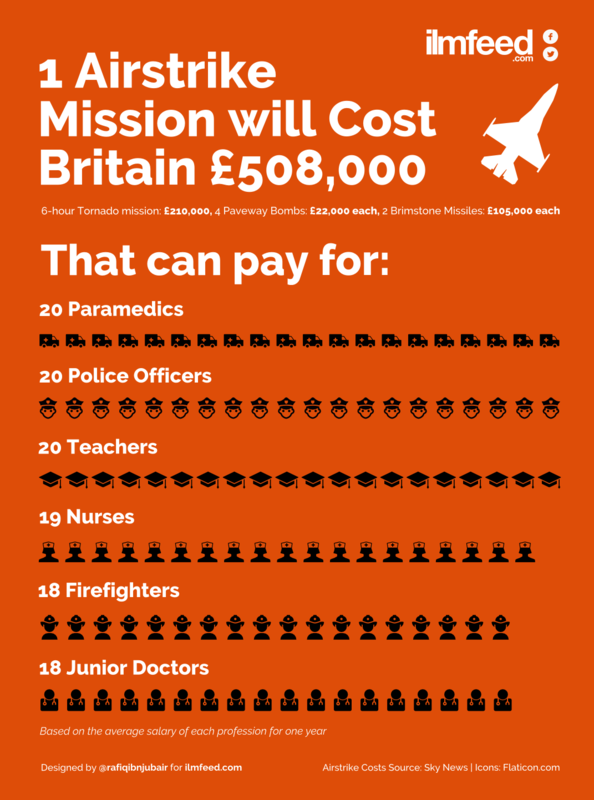 How Much Will Each Airstrike Mission in Syria Cost Britain?